Jan Andolan Party president Harka Bahadur Chhetri, who is believed to be close to chief minister Mamata Banerjee, today said his party would contest the upcoming municipality elections on its own. Chhetri, who was earlier with the Gorkha Janmukti Morcha, said the Trinamool Congress in the hills lacked able leadership and this lacuna would turn out to be detrimental to his party’s fortunes in the polls. The JAP president’s remark comes after Banerjee, while declaring Kalimpong a new district on February 14, failed to give Chhetri the credit for his contribution. Chhetri had floated the JAP by raising the Kalimpong district demand and making it its election plank. And the public rebuke did not go well with the JAP president. In the last assembly election, the JAP supported the TMC candidates in Darjeeling and Kurseong, while the Trinamool appeased the former by not putting up a candidate in Kalimpong to counter the GJM. However, the GJM emerged tops in all the hill constituencies. At a party programme in Darjeeling today to pay homage to D.K. Rai, army veteran and the face of the GJM’s statehood movement in Siliguri in 2008, who passed away recently, the JAP president said, “The TMC does not have able and credible leaders in the hills. The party only banks on the chief minister’s image. But she won’t be here for the civic body elections." In a clear rebuff to the TMC and dismissing an alliance, Chhetri said his party believed in healthy and civilised politics which was not the case currently in the hills. “We do not have any political parties that are parallel to our thoughts and ideology. 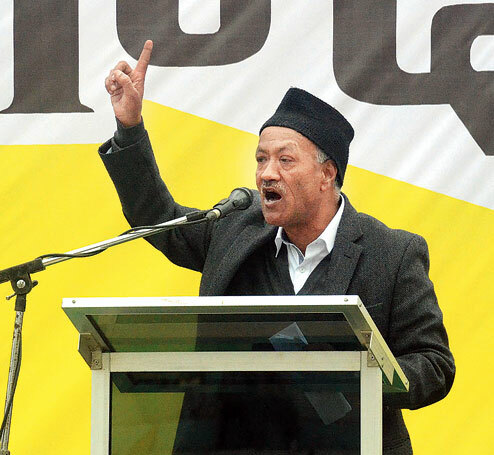 Therefore, we have decided to contest the civic elections on our own,” Chhetri said. The JAP leader also took a dig at the GJM for failing to work for the people and using the statehood demand to get out of difficult political situations. “We have come to know through an RTI that funds have been made available for the hills. But road conditions, drinking water, sewage and drainage system and street lighting and other basic amenities continue to deteriorate. There is no system and our party’s idea is to ensure this is rectified for good governance,” Chhetri said.